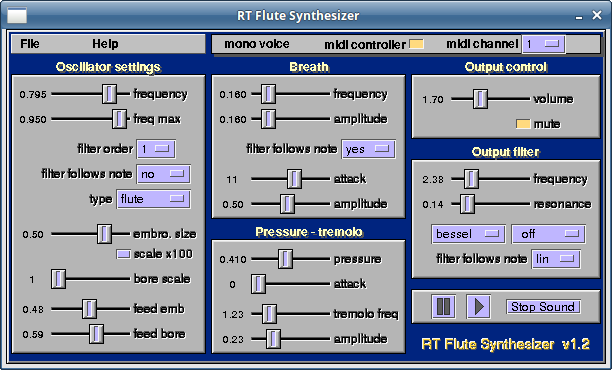 RTSynth is a unix-compatible realtime software synthesizer developed by Stefan Nitschke. The most recent release is version 1.9.5 and includes compatibility for both alsa and jack audio servers. It is available for download at the link at the bottom of this page. Once the tarball is extracted, the readme file explains the (few) necessary dependencies, as well as instructions to change ownership to root in order to allow for realtime performance. It will be necessary to copy the file "libRTSjack.so" to the /opt/rtsynth/ path. From the rtsynth directory, type ./RTSynth in a terminal to start the synth. RTSynth will reload the last session automatically. 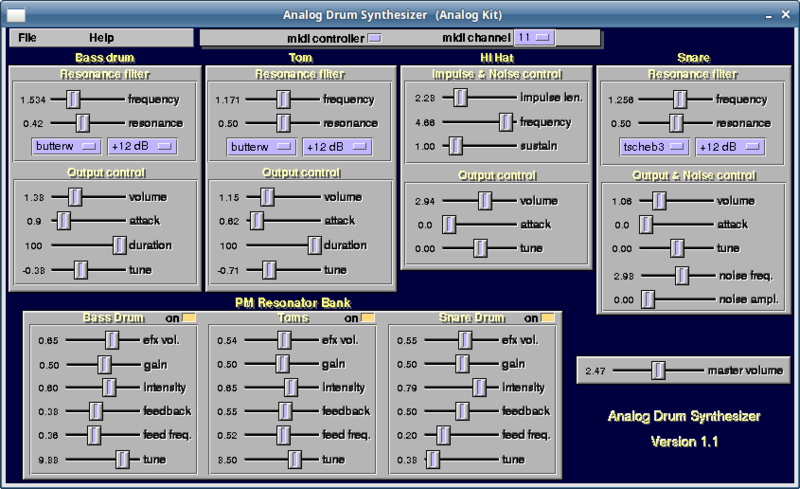 RTSynth also includes its own set of presets (click the "Presets" dropdown menu). Click the module's "Audio Output" and drag it to another module's "Audio Input" to connect them. (The instruments and effects can be chained together but not in a loop.) The effects modules include options such as universal filter (LP, HP, BP, 6-24 dB), distortion, PM resonator, normal resonator, chorus, delay and reverb. The Energy Dissipation section controls filter frequency, such as maximum high frequency, 6-24 dB influence, and damping. The additional wave panel provides both an extra waveform (sine, square, triangle, saw, pulse, piano, etc) and a noise signal. 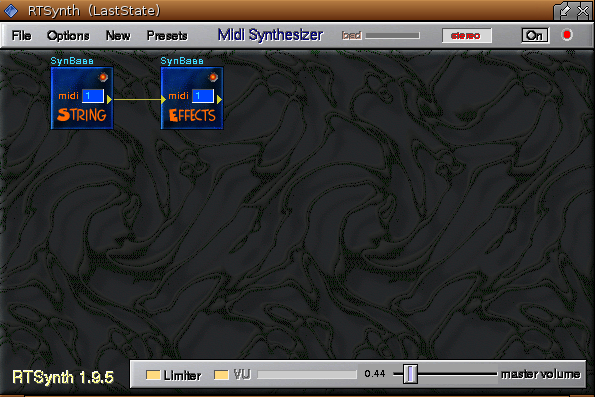 These outputs can be filtered and controlled at the Random Filter section. The Output Filter section controls the main filter in frequency, resonance, and filter type (Critical, Bessel, Butterworth, and two Tschebyscheff filters provided) as well as dB options: off, 6dB, 12dB, 18dB, 24dB plus 3 additional options that mix filtered and non-filtered signals. The Output Filter Envelope Panel and the Output and Note Control Panel include a variety of envelope options, such as panning, velocity, bass boost, dc-filter, LFO and a type of modulation control. The monophonic instruments includes several unique control parameters, such as breath attack, pressure and tremolo intensity. 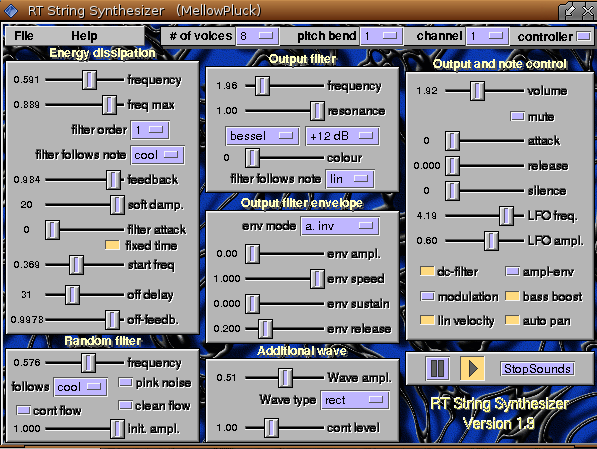 Filter types are the same as those of the polyphonic instruments. The two Drum synths (Power Kit and Analog Kit) include tuning, attack, duration and volume for the various sections: Bass drum, Tom, Hi Hat, Snare. A PM Resonator Bank section provides additional sonic control. User presets can be saved and loaded from the "File" dropdown menu. A fairly complete manual is available on the same page at the link below. Preset Bank 01 A few quick presets I made, some in the demos at the top of the page. These can be placed in the directory of your choice.